Not In Our Town was proud to screen our film, Waking in Oak Creek, to a packed hall at Google headquarters last week. The viewing was followed by a fireside chat between Google's Vice President for Global SMB Operations and Sales, Allan Thygesen, and our very own Patrice O'Neill. Googler and NIOT Board member, Annie Hsu discussed how the film not only brought out a lot of emotions, but left people ready to act. "I was incredibly moved to see how the simple act of watching the film together and having an open discussion left many of us Googlers more aware and knowledgeable on how we can take action to promote tolerance and inclusion in our communities," Hsu said. In attendance were also Mountain View Police Chief Max Bosel, Los Altos Police Chief Tuck Younis, Palo Alto Police Chief Dennis Burns, Palo Alto School Board President Melissa Baten Caswell, and Paul Bains, Police Chaplain for Palo Alto, East Palo Alto, Menlo Park, and Mountain View. 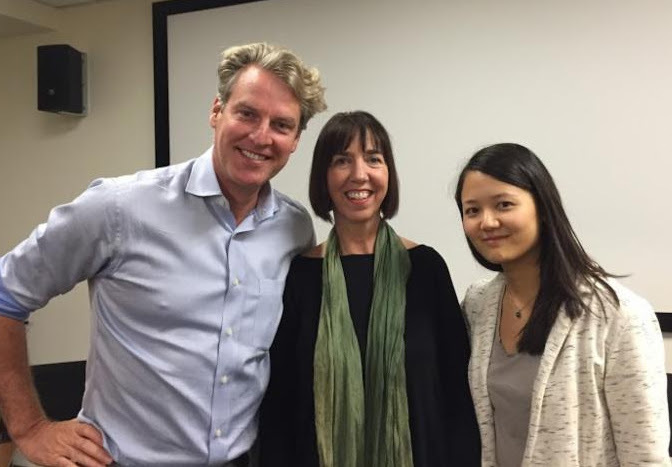 Thanks to Annie Hsu for helping organize the event, and to Google's Mary Hamershock and Colleen Ryan for convening! Screen Waking in Oak Creek for your community. Request a free DVD here.